After having met our English speaking driver at the pier start the journey through the Tuscan countryside towards Florence . Driving up the beautiful Viale dei Colli, we reach the marvellous terrace called Piazzale Michelangelo (named after the artist who sculpted the original David statue). Here you get the most impressive view of the city. Nearby you can also see the white and green marble façade of the S. Miniato al Monte church – one of the purest examples of the Florentine Romanesque style. Next we head for the city center, to the Piazza della Repubblica, surrounded by the historical literary cafés, where long ago important intellectuals gathered together. Following the Via De’Calzaiuoli, which connects Piazza del Duomo (S. Maria del Fiore, the Baptistery, Giotto’s Bell tower) to Piazza Signoria ( Palazzo Vecchio, Uffizi , etc.) you will be able to admire the best masterpieces of Renaissance art, breathing in the magical atmosphere that only Florence can offer. 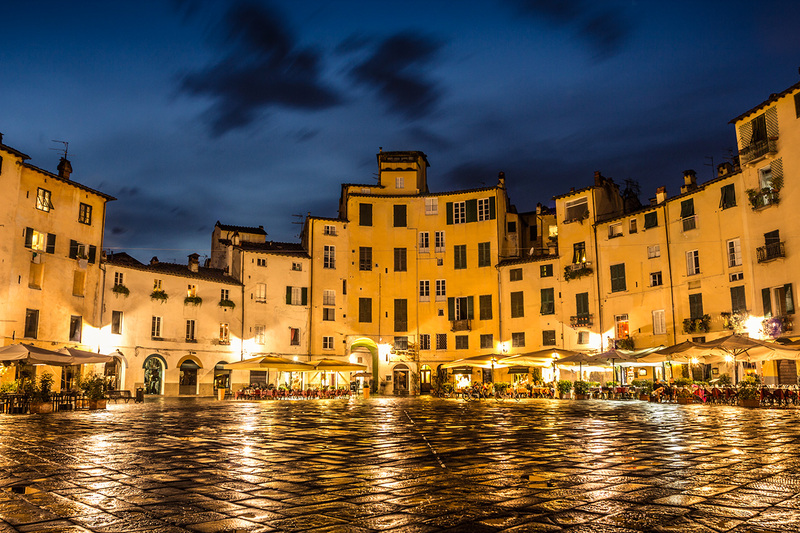 In the afternoon, you will leave Florence and enjoy the 50 minute drive to Lucca. Among the attractions not to be missed, the church of San Michele in Foro, the church of San Giovanni e Reparata and the famous Cathedral of San Martino which chapel, built by Matthew Civitali holds the sculpture of the Holy Face. An last but not least, certainly one of the features that make the city of Lucca unique in the world, Torre Guinigi: 44 metres high with a magnificent oak planted on its summit. Time permetting, very romantic walk will be over the ancient walls nowadays become a green park, enjoying the beautiful landscape of a city and of the many towers that stand out on the horizon of what once was a defensive fortification but now retains the charm to keep intact the heart of a beautiful Medieval city. After your tour of Lucca, relax on the 40 minutes transfer back to your ship in Livorno. If you want is possible to book your skip-the-line museum tickets in Florence. Ask to our booking office.